Note: Shipping additional on all items. Shipping charges are at my cost – no additional charge for packaging. Most items ship UPS unless they fit in a USPS flat rate box. Product Guarantee: If products are not as described you may return for a refund. No returns on electronics. I don’t do a lot of engine building for others because of the time involved. HOWEVER, I have several blocks with different bores so I am able to assemble the components for a short block without shipping the heavy item – the block. This save us both the headache and expense of crating and shipping a block or short block. At minimum, I would need the rotating assembly, one head and the valve train you will be using or I can supply any missing item(s). If interested give me a call and we can go over the details. MSD Digital 7 w/boost retard (# 7535) The mother of all boxes. Perfect for any supercharged engine plus an easy unit to setup. All functions such as burnout rpm, launch rpm, max rpm, turbo spool-up rpm, rpm/time/pressure activated switch, 32 point boost retard map, 32 point gear retard map plus many other features are quickly set with the furnished laptop software. 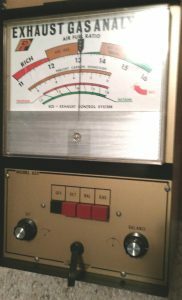 Each set of parameters can then be saved for future reference or loaded back into the Digital 7. No additional 2 or 3-step limiters to purchase. Digital 7 has not been run since MSD factory checkout. Now one might ask: “If so good, why are you selling it?”. Convinced that a MSD Pro Mag would burn the fuel better, I spent $3000 on a setup for my 354. Bad news – the Pro Mag did not improve performance. Good news – I can use the cross drive Pro Mag as a backup on my late model hemi. Cost $1000 at Jegs. 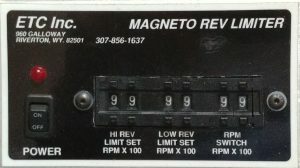 $475 + shipping Note: You can on-line search for MSD 7535 and view a PDF of the extensive features at the Jegs site. 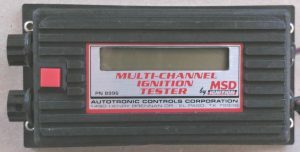 MSD Multi-Channel Ignition Tester #8996 This will test MSD 6-10 boxes as well as Digital 7 and DIS systems on 4, 6 or 8 cylinder engines. I bought this new about 8-years ago but never used it since I went to a Pro Mag. The #8996 has be superseded by #8998 which is a single channel unit (doesn’t check the DIS systems). If you do an on-line search for the #8996, the installation instructions (schematic) can be viewed on several sites including Jegs. Includes test spark plug and complete instructions in original box. It sells for between $300 and $400. I’ll part with this piece of “gold” for $145 Note: This unit will not check the cam sync pickup circuit. Ground .002 under for high performance applications. Have both rod and main bearings if needed. Flywheel flange tapped for 1/2-20 bolts. Partial Sets – I have partial sets of good 331/354 M/T, Howard, BRC, C&A rods. If you’re trying to fill a partial set give me a call or email me. Note on steel rods (11/2018): I spoke with Molnar (molnartechnologies.com) about the possibility of making a standard length rod for a 331-354 Chrysler hemi that accommodates big block Chevy bearings. The benefits are obvious as good 331-354 rod bearings are getting scarce. In addition, it would serve as a “crank saver” as there is a lot of undersize and damaged cranks floating around. It would be a 4340 billet steel machined “H” beam with ARP 2000 bolts. Molnar indicated they would make a batch and see how they sell. Check their website for availability. Alcohol note: I have been asked numerous times about compression with alcohol. Something around 10:1 with the small motors works good. More compression is OK but hard to get with less displacement. Here’s my gas to alcohol story: After breaking the crank in NE1 at the March Meet in Bakersfield, I was a little panicked because our altered association had a meet two weeks later. With no time to replace the crank, I searched my “junk pile” and found a 8.25:1 gas short block with four of the tops of the pistons caved in due to heat. So maybe 7.5:1 on those four cylinders. I installed the short block and made the race. 7.66 @ 176 mph on alcohol with a 2000 pound car – not too bad! Ready to take on a cool project? I have (2) sets of Arias 4”pistons and (2) 3” stroke crankshafts to build large bore x short stroke 301 ci engines. These ran as a 8.25:1 supercharged gas engines in a drag car but would also be good on alcohol or for a street project on gas. I purchased them along with a couple sets of aluminum heads but did not receive any connecting rods. Not knowing how far the piston protrudes into the combustion chamber makes the rod length a mystery. As noted above, I could assemble an engine and using one of my adjustable connecting rods and figure it out. But, I’m never going to use these engines so just wasted time for me. Here’s where you come in! If interested, give me a call and we can discuss the details. Piston set “A” – 2.380 compression height. Rings: 3/64, 1/16, 3/8. The top rings are chrome/stainless and are included as well as the oil rings. I have many rings both new and used. When I remove a set of rings about half are perfect and OK to put back in but I usually replace the whole set. Most of the chrome/stainless .017 Dykes are for a 4″ bore. I also have some new .017 Dykes for a 392 (4.062 bore) and some complete moly sets for a 3.875 bore 331. If you’re running supercharged gas for the first time you’re going to go through rings – give me a call – I’ll save you a lot of $$$$. Note: Used Dykes rings are considered good if: 1) the chrome is not burned off the face of the ring 2) they have not collapsed from heat. Used rings purchased from me will meet this criteria. Piston Rings – Here’s a plug for my long-time friend Bruce Walker. If you need piston rings, Bruce can be contacted at BWE Piston Rings 805-985-1008 in California. Bruce can supply just about any size ring at competitive (or cheaper) prices. Give him a try. Note: These intake valves are a little longer than stock but the geometry is OK for my 331 heads and accommodate the higher lift cams. Check the pattern across your valve tip before buying ANY valve. HEAD GASKETS – Any of these sets will work for supercharged gas as well as stock applications. NOTE: I can cut the 3″ pulleys down to 2″ for an additional $25. (2) Sets used 5-point 3” seat belts and shoulder harness assemblies. Out of cert – good for street or off-road. $10 ea. MAGAZINES / NEWSPAPERS – OWN A PIECE OF HISTORY! Drag News originated on the West Coast (Lions, Fontana, San Gabriel, Orange County, Fremont, etc) and then evolved into nationwide coverage. National Dragster (NHRA publication) covers nationwide with about 30% more pages than ND. I’ve only inventoried up to 1990. I also have National Dragster, Hot Rod Magazine, Street Rodder, etc up to 2000. If you’re interested in issues after 1990 let me know. I also have some odds and ends like the Funny Car Pictorials from 1970, Hot Rod Magazine yearbooks (’70’s), etc.